As a dedicated ENERGY STAR® partner, Coinmach offers owners and managers the most environmentally responsible laundry machines available today. Residents today are more eco-conscious than ever before, according to recent consumer reports. ** Residents utilizing green laundry amenities often place greater value on their communities and so will you as lower utility bills add up to increased cost savings. Attract new residents and increase retention rates by partnering with Coinmach to install the most energy-efficient machines at your community. Save Water – Reduce Costs – Contact Us Today! 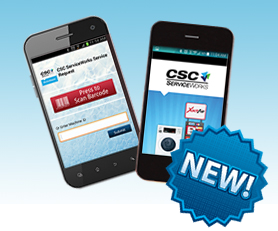 Speed up your day with our NEW CSC ServiceWorks Service Request App – Just scan and submit!